Anyone who has even a passing familiarity with Savidge Reads or The Readers knows that he doesn’t like novels that take place on ships. I don’t quite understand his aversion. Although I am prone to motion sickness and wouldn’t necessarily be drawn to a book that takes place on a little sail boat, I do love ships and have read some really good books that take place on them. 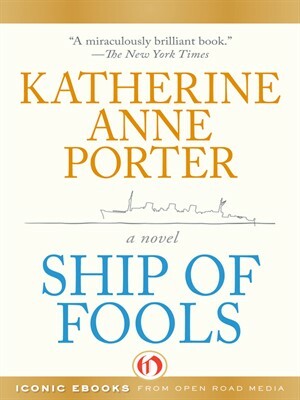 There is no part of me that thinks that I will change Simon’s mind, but I hope I can convince him to give Katherine Anne Porter and her amazing novel Ship of Fools a chance. Of course I am also aware that he has so many books on his TBR pile that convincing him to read anything is unlikely. But hey, a boy can dream. Although I do not e-read, I do love that Open Road Media continue to focus on amazing neglected fiction by reissuing both e-books and actual printed books. (Barbara Pym!) One of their latest e-book reissues is Ship of Fools. Pre-World War II, a German passenger vessel making its way from Veracruz to Germany. A really interesting story about the disparate lives of the first class and mostly anti-Semitic passengers, the way they mix and the way they don’t mix. It was one of my favorite reads in 2009 and one of the Modern Library’s Top 100 Novels of the 20th Century. This has been on my to-read list for about seven years, now I’ve just moved it way up to the top based on your rave review. Sounds like a perfect big fat book for the summer. Thanks for the recommendation! (And I love books set on ships. I would also love to be ON a ship reading a book, but I don’t see that happening in the near future, sadly). The copy I have is old and ratty and would be perfect to take on my rafting trip if I hadn’t grown inexplicably fond of that beat up old thing. I haven’t been able to get rid of it. I might find that interesting. If it was about the Titanic I would not. Kate and Leo taught me everything I need to know about that ship. I appreciate Open Road Media’s efforts, too! Adding this to my wish list. Thank you Thomas for Open Road link and Ship of Fools review. I have passed on SOF in past because when I was a kid I watched the movie on TV and loved the actors and have watched it as adult and stil mesmerized by Simone Signoret, Vivien Leigh, Oskar Werner, entire cast and feared book somehow wouldn’t grab me, that I just had a fixation on the movie cast. But now w/ your review….well it’s on the TBR pile as soon as i find it…many thanks. I saw the film after reading the book but it didn’t hold my interest as much. That’s totally on my TBR. Can’t wait to read it! It is definitely a neglected classic for sure. Well, I’m adding it to my list. (As well as Dead Wake). Simon may come around eventually since you know him well and it’s a personal recommendation…maybe. I might push the issue with him. We are supposedly doing an upcoming podcast where we make a list of the seven books we wish the other would read. I’ve had this one on my mental list since Simon visited last summer.